Veirs was raised in Colorado. While she heard folk-country, classical, and pop music at home, she didn't "listen seriously," she says, until her 20s. She joined an all-girl punk band called Rair Kx! while a student at Carleton College. She now lives in Portland, Oregon. After graduation, her taste moved to older country and folk. At Carleton she studied geology and Mandarin Chinese. After graduation, she worked as a translator for a geological expedition in China; during the trip she began writing lyrics. In 1999, Veirs released a self-titled album, which was recorded live and featuring just her and guitar. 2003 saw the release of Troubled by the Fire, accompanied by veteran musicians such as Bill Frisell, Amy Denio and Fred Chalenor. 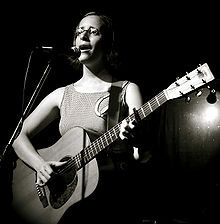 She then signed to Nonesuch and released Carbon Glacier. Year of Meteors followed in August 2005. Year of Meteors was selected by the New York Times as a "critics choice". Veirs released Saltbreakers in 2007. July Flame appeared in January 2010 on her Raven Marching band label. The Washington Post praised it. Portland-based producer Tucker Martine has produced her last six albums, and plays many instruments on the records as well. Their son, Tennessee Veirs Martine, was born in April 2010.